The Duke Blue Devils didn’t have it easy in the month of January. 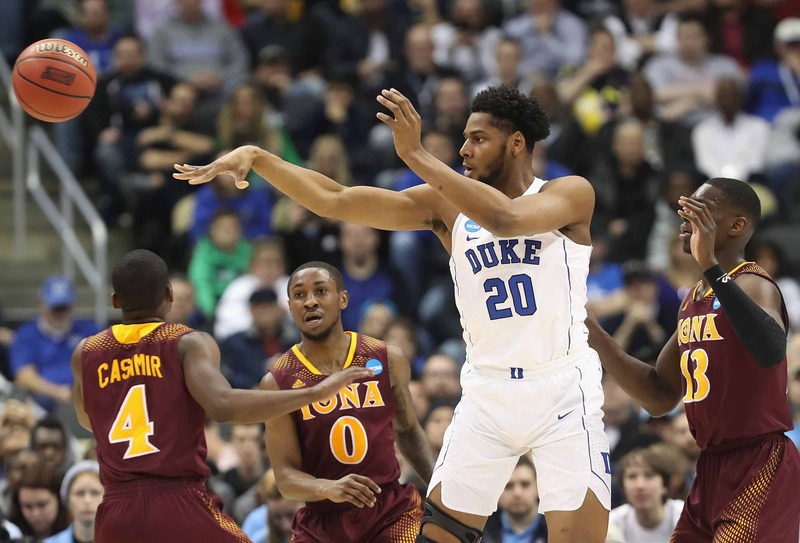 They lost their starting point guard Tre Jones for much of the month due to a separated shoulder. Even with his absence the Blue Devils fought through the rough spot and are still in great shape to challenge for the NCAA Championship. In fact, the current NCAA Championship futures betting odds have Duke listed as the favorite at +200. They are one of only two teams getting single digit odds with Gonzaga at +800 being the other. Duke has only lost twice this year—once to #3 Gonzaga and once to Syracuse in the game where Jones suffered his shoulder injury. With a record of 17-2 and a tenuous lead atop the Atlantic Coast Conference, Duke is currently ranked #2 in the country. They passed one of the big tests of their conference season earlier this month when they beat #4 ranked Virginia on their home court. Virginia is also among the NCAA futures favorites coming in as the co-fifth choice along with Michigan at +1100. If there’s a team that could claim they’re not getting any respect from the betting public it would be the Tennessee Volunteers. The Vols lost to then #2 Kansas on November 23 and haven’t lost since. A victory over West Virginia on Saturday, January 26 ran their winning streak to 14 games. Tennessee is now ranked #1 in the country and has a signature win over Gonzaga earlier this season. Yet despite their top ranking in the current AP poll the Volunteers are the #6 choice in the NCAA championship futures market priced at +1400. The teams priced at 25/1 or lower are as follows. Duke (+200), Gonzaga (+800), Kansas (+1000), Michigan State (+1000), Michigan (+1100), Virginia (+1100), Tennessee (+1400), North Carolina (+1600), Kentucky (+1700), Nevada-Reno (+1700) and Auburn (+2500). The biggest longshot among the top thirty betting interests are UCLA and Wichita State each at +10000. Duke will play on the road at Notre Dame next followed by home games against St. John’s and Boston College. They face some tough tests during the month of February playing at Virginia, at #23 Louisville and home against #21 North Carolina State and #11 North Carolina. They’ll play a rematch at Syracuse and close out the month with a road game at #10 Virginia Tech. Tennessee also has a tricky schedule coming up. They’ll play a tough but erratic South Carolina team in Columbia on 1/29 followed by what should be a fairly easy game at Texas A&M (1-5 in SEC play). They then return home to take on Missouri, Florida and a return date with South Carolina. They’ll face #8 Kentucky on the road followed by a home game against struggling Vanderbilt. They’ll close out the month of February with a pair of tough road contests against #25 LSU and #20 Ole Miss.